Feeding Wild Rabbits: Did you find cottontail rabbits? Did your dog disrupt a nest? 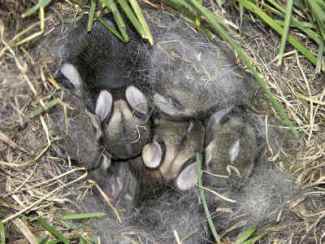 Unless you know the cottontail mother is dead, it is best, if possible, to find a way for the little kits to remain in their shallow nest, right where they are. If you found a nest like this one in the grass, it'd be easy to think these kits are orphaned. Most likely however, the doe is hiding nearby, just waiting for nightfall to return to her babies. Katelyn in Texas recently discovered that her dog had dug up a cottontail nest in her backyard. Click here to discover how she handled the disturbed wild cottontail nest. If you find such a nest, please just leave it undisturbed, unless you KNOW the mother is dead. You don't want to be feeding wild rabbits, dooming them to a perhaps 90% chance of death, when it may not be necessary. But if you know they’re orphaned, you'll need rabbit milk formula and clear directions. Lou Rea Kenyon, an RN and licensed wildlife rehabilitation expert, owner of Nutkin’s Nest Wildlife Rehabilitation Center, has provided online instructions for feeding wild rabbits (orphans), until recently. The site is no longer available. What follows are the main points of the SquirrelWorld "Rabbit Rehab" protocol for feeding wild rabbits, summarized here with permission from Nutkin’s Nest (Squirrelworld). 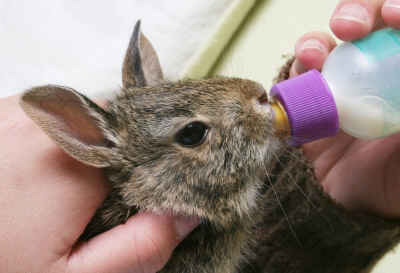 It's suitable for both wild cottontail and domestic rabbit orphaned kits. (1) Kits are handled and tamed by a single caregiver only. This is because feeding wild rabbits is difficult and dangerous to the kits if they are crazy with fear. Kits remain calm with handler, but fearful of anyone else. Upon release, they "wild out" without a problem, yet remain unafraid of their one single handler. (2) Bunnies under 2 weeks old need a bunny incubator. Normal bunny body temperature is 102F - 103F. You'll need a heat lamp or other source of heat to help the kits maintain their body temperature. (3) All orphans are assumed to be at least somewhat dehydrated at the time they are discovered. Examine the baby orphan rabbits for degree of dehydration, plus, check it over for any life-threatening problems. Dehydration is seen as tenting of the skin. When you pull on it, it remains somewhat pulled away from its normal position against the rabbit's body. (4) Hold the baby rabbit securely yet safely when you hold it. Be alert - bunnies have an uncanny way of relaxing, tending to cause the handler to relax, and then they thrust madly with their large hind feet, attempting a super-bunny leap to freedom. (5) For a formula, we recommend PetAg's Goat's Milk Esbilac or Esbilac for Puppies. These are nearly identical and equally excellent. Both these formulas need additional fats when fed to baby cottontail or domestic rabbit kits. Add 1 part heavy cream to 8 parts of reconstituted formula. Kitten Milk Replacer (KMR) can also be used; add 1 part heavy cream to 5 parts reconstituted KMR formula. (7) Use the size of the bunny's belly to gauge when to stop feeding for that session. Meaning, ignore formulaic approaches to feeding wild rabbits. Look for a belly that is slightly round and slightly firm, but not hard or taut. Feed every three hours the bunnies with eyes that are still shut, and feed a lot less than the charts typically recommend. (8) A baby rabbit's almost-empty abdomen will tell you when it is time for the next feeding. (9) Stimulate urination and defecation after every feeding for bunnies with eyes still closed. (10) Keep your eyes peeled for changes in its feces. Any sign of softness means you must reduce the frequency or amount of feeding, reduce stress levels, etc. Also, with eye-open bunnies, you can administer additional doses of cecotropes from a healthy rabbit. This is KEY to the baby rabbit’s survival. (11) Before introducing ANY SOLIDS WHATSOEVER, you'll need to seed the rabbit’s gut with the correct bacteria for health. The best way to do this is to mix formula and cecotropes (not the round hard droppings, but the soft, smelly, grape-like clusters) into a slurry and feeding baby rabbits this mixture for three days BEFORE starting ANY solid food. Some babies will even lick them off your finger. (12) You can substitute Bene-Bac® as an alternative if you (or a friend) don't have a healthy rabbit on hand from which to obtain cecal pellets. Bene-Bac is short for 'beneficial bacteria' and works well with small bunnies. At any point between 1-day and 10-days of age one can begin adding Bene-Bac to the formula, according to the manufacturer. If using cecotropes, day 10-11 is early enough as kits begin nibbling them in the nest box as soon as their eyes open (day 10). 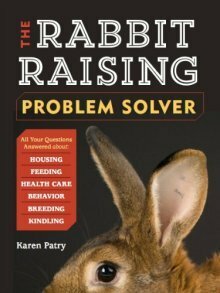 (13) Weaning starts with the introduction of solids into the baby rabbit’s diet - the crucial danger zone for fatal diarrhea. Once the baby rabbit has diarrhea, it is usually too late to save its life. If you skip the 3-day cecotrope (or Bene-Bac) step, the baby rabbits will die from diarrhea. (15) Both cottontails and domestic rabbits can be weaned around 4-5 weeks of age. (16) Baby cottontails spend a few more weeks in a large enclosure learning life skills through playing with littermates. This increases their chances for survival in the wild. (17) "Slow release" - simply open the door of the large enclosure, and allow the youngsters to come and go. When they’re ready, they’ll hop off on their own. (18) Set up the local area with various hiding places, like brush piles, so the youngsters can run and hide, if need be. TIP: People love Miracle brand hand-feeding syringes. But a main complaint is that the black markings disappear after a few washings. I suggest adding scratched lines (with knife or other sharp object) at each important demarcation so you won't lose the reference points and will always know how much each animal has been able to ingest at each feeding. Over the years, standards for feeding orphan rabbits have changed slightly. From the Sixth Edition of Rabbit Production (1987) to the Ninth Edition (2013), the rabbit scientist authors changed their recommendation from puppy formula to kitten formula. The latest edition also removes their recommendation of using cow's milk, though one of their suggested formulas still uses evaporated (cow's) milk. Another oversight in both volumes is the omission of the critical step of feeding baby rabbits the cecotropes of healthy adult rabbits (or Bene-Bac). Nevertheless, in a pinch, perhaps the following ideas may prove valuable to you, especially if you've been suddenly caught with orphan rabbits and don't have on hand the perfect formulas. Formula 2: Evaporated milk diluted 50:50 with water. To every cup, add: 1 egg yolk, and 1Tbsp corn syrup. Heat to just warm before bottlefeeding. Whatever formula you end up using, whether one of these or an amalgamation of them, your best bet is to use it in conjunction with the guidelines on this page as a whole, especially: (1) adding heavy cream to the formula and (2) adding cecotropes or Bene-Bac 3 days before starting any kit on solids. Good luck with feeding orphan rabbits!